From July 1st 2017, German Shepherd Dogs (bred under the GSDCA Breed Improvement Schemes) have one method of unique identification required as a prerequisite to participate in ALL GSDCA breed Improvement Schemes, which is a microchip. “As of the 1st July 2017, the German Shepherd Dog Council of Australia (GSDCA) has ceased tattooing of all German Shepherd Dogs and puppies”. Both the identification methods provide a permanent identification of the animal. The GSDCA Tattoo Scheme ceased on 1st July 2017. The following details the scheme and information pertaining to animals tattooed up to and including 30 June 2017.
tattoos also have an extra letter at the end) and the tattoo is stamped into the right ear. A Tattooing Register was (and still is) kept by each State Registrar and each breeder was allocated a prefix set of 3 letters as an identifier of their kennel. Most tattooing was conducted when the puppy is 8 weeks old and a nominated Tattoo Officer applied the nominated tattoos. If a dog was not tattooed as an 8 week old puppy, an AUS symbol could be applied for. The AUS symbol was applied when the dog was under general anaesthetic (usually at the time of hip and elbow x-raying). Tattooing has proven to be useful in identifying dogs in a number of scenarios and is positive proof of ownership. It is used as a positive identification by a veterinarian when x-raying individual animals for the Hip and Elbow Dysplasia Schemes. 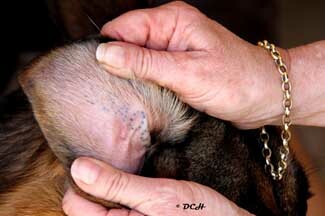 Tattoos are checked at the time of Breed Survey as a positive identifier of a submitted dog. Ear tattoos have also been used by poundkeepers and rescue centres to positively identify lost dogs which assists in the return of a lost dog to its owner. There are a number of regulations governing the use of Tattoo Symbols and these can be viewed in the Regulations Manual Section 3.2.1. This section of the Regulations Manual clearly details all aspects of the GSDCA Tattoo Scheme however the following points should be noted in regard to tattoos that are difficult to read. 1. Record the last tattoo number of the previous litter. 2. That the tattoo number and the animal correspond. 3. On completion of tattooing the litter make sure the paperwork is correct. 1. Check the provided paperwork and also the last tattoo number from the previous litter. 2. Carry out tattooing in accordance with the Regulations laid down by the GSDCA. 4. Ensure the ink is evenly and adequately applied to have a clear distinct tattoo. 1. Breeders should check prior to new owners receiving their puppy that the tattoo is clearly visible and corresponds to the paperwork. 2. If a mistake is made by the tattoo officer e.g. double numbers, or a wrong letter, the National Identification Registrar should be notified immediately in writing detailing the mistake and a copy of the correspondence should be forwarded to the National Breed Commission Chairman to place on file. What happens if the Tattoo is difficult to read at Xray time? 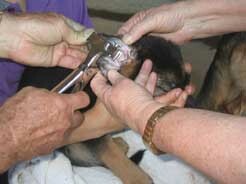 The following cases give the owner and Veterinarian some guidance in this situation. Case 2. If the tattoo is not visible at all, then the owner is to apply for an “AUS” number. This is to be applied when the dog is under anaesthetic for the hip/elbow x-ray, by a Club Tattoo Officer, not the veterinarian, in the right ear. In both cases, the attending club tattoo officer is to report this to the club’s Tattoo Registrar for GSDCA recording purposes. After x-raying if the paperwork is found to be incorrect in relation to positive identification, the owner will be informed that the animal is required to be re-x-rayed. It is imperative that the RULES ARE ADHERED TO! All owners and breeders must be aware that the only accepted means of positive identification that the German Shepherd Dog Council of Australia accept for any of the GSDCA Breed Improvement Schemes is a GSDCA tattoo, a tattoo from a GSDCA recognized scheme and microchipping.